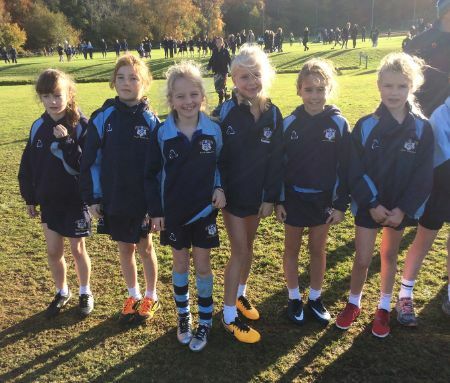 First away, the U9 girls worked hard over the 1.5km course, packing well and achieving the lowest score of the Saint Ronan’s girls’ scoring teams with seventy nine points. Daisy A was first home in thirteenth place followed by Alice M (21), Jemima W (22) and Mischa W (23). Lucienne SD (28) and Athena M (30)paced themselves well, finishing strongly down the home straight. Sydney W continued her excellent form this season, leading the U11 girls home in eighteenth place. In the absence of Lottie H and Millie DH, our team was competing at the bottom of the age group; credit must go to all the girls for their stoical performances. Lottie B (32), JoJo CM (42) and Clara S (59) gave their best and finished with smiles on their faces… once they had recovered! The U13 girls’ field was the smallest of the afternoon – it is a challenge to persuade girls in years 7 and 8 to run (a shame as the sport is so good for their fitness! ), the blue hoops of the Saint Ronan’s girls standing out as they tackled the 2.5km course with determination. Bea W (9) is developing into an excellent little athlete and Hope R (19) had a good run, returning from an achilles injury. Jemima S (28) and Lotty C (30) brought the scoring total to eighty-six, 16 points behind Kent College in third. Chloë L (38) ran with her trademark determination and should feel very proud of her performance.